I didn't like Taub not being in this episode. I'm not sure exactly why it bothered me, but I guess I got used to having him in the episodes... at this point he's a little easier to relate to than Park, Adams, or Foreman. And, with the absence of Cuddy this season (who I found pretty easy to relate to), it's important to have some sort of character that seems realistic to a certain extent. And, speaking of ridiculous characters, can anyone see Melanie Lynskey as anyone other than Rose from Two and a Half Men these days? Don't get me wrong, I loved her as Lurlynn in Sweet Home Alabama, but I think that she's kinda "holed" as Rose these days. But here in House? I don't think that she really shined. Not that the patient or the case were all that memorable, either. The ongoing Foreman-House battle for power is getting old. Trying to give Chase's character some new depth via a sister ain't gonna do much. I think we all need to accept that this show is just about done. I'm seeing one more season at best, people. I wouldn't be surprised if FOX blows the whistle on the show any day now. The first eight episodes averaged 7.5M views each, but that's counting the season opener, which came in with 9.78M... since then, it's only gone over 7.55M twice - and once was for this episode, the first since November. We're looking at four more new episodes in the next four weeks... then another month-long hiatus. Anyone want to argue that these are good signs? Soon, he wanders out of the hospital, but Chase and Adams find him at a track field not far away. When the patient comes to after being frozen, he's speaking Portuguese, his native tongue. 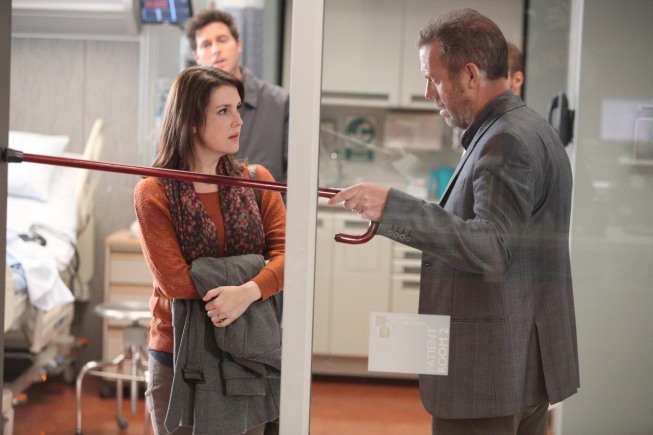 House can't go to the patient's house to check for toxins, and he can't make the team do it because Foreman overruled him, so he tries to talk to the patient's wife, but that doesn't really work. [really? nobody went to the house? that is so rare!] House was, however, able to translate about what her husband was talking about. Now, the final round-up. Taub wasn't in this episode because he was "taking time off for a sick daughter." Chase calls his sister for the first time in years. The most memorable thing said was, "most happiness is based on lies."